The world's first 3D Blu-ray was announced at CES 2010, with the accolade going to Monsters Vs Aliens. The 3D Blu-ray was unveiled in Samsung's packed press conference, where the company revealed it has partnered up with DreamWorks (who created Monsters Vs Aliens) and Technicolor to bring 3D content to the masses. To celebrate the announcement, Samsung brought on to the stage the CEO of DreamWorks, Jeffrey Katzenberg who revealed his love for Samsung's 3D plight. "As a company, Samsung looks to lead the charge," noted Katzenberg. "It reminds me of the commitment that we at DreamWorks made in 2007 to bringing 3D to the masses. We have to acknowledge the leadership and innovation coming from Samsung. It represents the finest work going on in home entertainment today." Alongside the DreamWorks CEO was Fred Rose from Technicolor, who was equally glowing about 3D, saying: "Today we are very proud to support the integration of 3D into the home. "Like Samsung and DreamWorks, we believe that 3D in the theatre is the gateway to 3D in the home. Our innovations are making 3D in the home possible." And if you thought that you won't be able to beat watching 3D movies in the cinema, Rose doesn't think this is the case, explaining: "I can promise you, the home version of Monsters Vs Aliens playing on the Samsung flat-screen will be just as life-like as in the cinema." 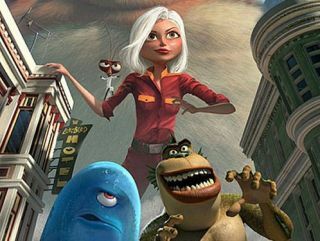 You will be able to see for yourself, when both the Samsung 3D LED TVs and Monsters Vs Aliens on 3D Blu-ray come out sometime later in the year.